AS Apollon Patras (A1) signed 27-year old American (has also Bissau-Guinean passport) point guard Perry Petty (185-86kg-88, college: UTRGV, agency: Basketballwise). He played last season at Moutahed in Lebanese Division A. In 22 games he was fourth best scorer with impressive 21.8ppg and averaged 6.9rpg, 7.3apg (leader !!!) and 2.9spg (leader !!!). A very impressive season as he was named to Asia-Basket.com All-Lebanese League 1st Team and All-Imports Team. Petty also played at Szolnoki Olajbanyasz in Hungarian league that season. But in two Adriatic League games he was fourth best scorer with just 1.5ppg and had 2.0rpg, 2.0apg (leader !!!) and 2.5spg (leader !!!). He also spent pre-season at Virtus Acea (Serie A) in Italian league that year. The most of previous (2013-14) season Petty spent at Consultinvest VL Pesaro (Serie A) in Italian league. In 14 games he recorded 11.4ppg, 3.8rpg, 3.1apg and 1.2spg in 2013-14 season. The other team he played shortly was Tsmoki-Minsk in Belarusian league. In 7 EuroChallenge games he recorded 11.7ppg, 6.4rpg, 3.1apg and 1.9spg in 2013-14 season. Petty also played 10 games in VTB United League where he recorded 8.2ppg, 3.0rpg, 3.5apg and 1.4spg in 2013-14 season. The previous (2013) summer he played at Trotamundos (LPB) in Venezuelan league. In 5 games he recorded 5.2ppg, 1.8rpg, 3.0apg and 2.4spg in 2013 season. The list of the past achievements is quite long as among others Petty's team won Belarusian Cup in 2014. He was also voted USBasket.com All-PBL Player of the Year back in 2012. Petty is quite experienced player. He has played also professionally in Romania (Giurgiu), Slovakia (Vahostav-Zilina), IBA-PBL (Cent.Illinois D.) and D-League (Reno Bighorns). 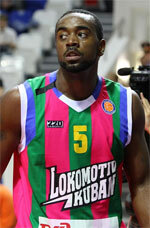 Petty is a former Eurobasket Summer League player, which is considered top international summer league on the market. He attended University of Texas Rio Grande Valley until 2011 and it will be his fifth season as a professional player. Petty could be described: Perry is a Point Guard that can control the tempo of a game and creates problems with his shooting ability on the offensive end of the floor. He is a very aggressive defender and is able to guard positions from the 1 or 2. Great rebounder for his position and is able to be very effective in the pick and roll set. I'm humble, carefree and a kindhearted person. I enjoy joking around and making people laugh. Nothing bothers me besides losing. I work hard and expect to be the best. I love spending time with friends and family. I like challenges, accomplishing things people say i can't.